As you become a self-sufficient adult, which should include learning how to manage your finances wisely, you should know that credit cards can be a great financial tool. They help you build your credit score, which is something you have to do if you want to take out a loan for a house or car, or rent an apartment. Credit cards can also be a way to earn rewards to make necessary purchases cheaper with cash back, or to help you fund a much-needed vacation with travel rewards. However, while they can be useful at times, people often take advantage of their credit cards. It’s after moments of reckless abandon that “chargers” find themselves in debt with massive bills they can’t even begin to think about paying off. Trust me! I’ve been there. It was just a couple of years ago that I finally faced my credit card debt so I could work on paying it off and get smarter with my overall financial choices. Although I have started using credit cards again as part of my financial strategy, I now do so smartly and in a limited manner until I know I can fully trust myself again. 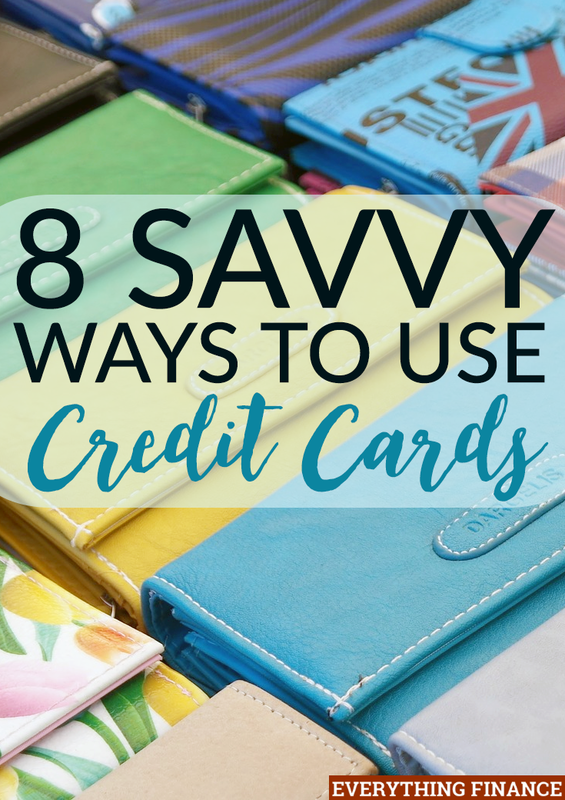 Instead of ending up in trouble like me and so many others because of using credit cards incorrectly, you should look to these 8 savvy ways to use credit cards. Rewards can be a wonderful perk when using your credit card. However, if you aren’t the type of person who’s going to travel frequently, then earning flight or travel rewards probably isn’t the most beneficial. Instead, you should opt for a card that rewards you with cash back. It’s also important to remember that rewards are a perk. So if you’re spending too much to try and earn those rewards and you can’t pay your bill in full, a rewards program is not worth the hassle. The best thing to do when picking a card is to analyze your spending and paying habits, and figure out which card best fits your needs. When it comes to credit accounts, less is always better, in my opinion. I know some people make a habit out of “credit card churning” to take advantage of the best rewards programs and benefits, but that doesn’t work for most people, myself included. In fact, when people open too many accounts, they are more likely to find themselves in financial trouble. Multiple accounts are difficult to keep track of, which leaves greater room for error when it comes to keeping track of your purchases and payments. A good rule of thumb that is recommended by many financial experts is to open and use no more than two separate credit card accounts. This may seem obvious, but it’s important to read carefully when you’re choosing and opening an account. The terms and conditions will alert you to any fees and interest charges you may not find out about up front in big bold writing. You could get charged for annual fees, late fees, over limit fees, or balance transfer fees. It’s important to take a look at these and figure out if any will apply to you and if so, how frequently. These fees could dip into your wallet more than you’d hoped. Again, this may seem obvious, but paying your bill on time is a big deal. Paying late will result in a drop in your credit score, a rise in your rate, and of course, a late fee on your statement. Make sure to mark your due date on your calendar or opt to receive email reminders so you’re always on time. Also, make sure you take into account any processing time you may need to wait for, as that could result in a late payment as well. This is one reason I finally stopped paying my bills via mailing in a check payment. Ultimately, paying in full is the most ideal practice. If you choose to only pay the minimum each month, you’ll hurt yourself financially. Even if you don’t have the full amount, you should pay as much as you can. Paying only the minimum means that your balance will increase thanks to your interest rate. Therefore, you’ll have more to pay off in the end. Paying more than the minimum means you won’t have as much of a balance for your interest to build off of. Even if your card has a zero percent introductory rate, pay off your balance in full to start building a good financial habit. If you have multiple cards and are unable to pay them all off completely, it’s important to prioritize your payments. Take a look at each card’s interest rate. Whichever card has the highest rate should be paid off in full. Go from there and pay down each balance as best you can, based on interest rates. Again, you’ll save yourself from getting further in debt by paying attention to the cards with the higher rates. Just because you have a $10,000 credit limit doesn’t mean you should spend $10,000 in a day. A credit card isn’t free money, simple as that. Not only does maxing out your credit card hurt your credit score, but it most likely means you’ve given yourself a hefty balance you won’t be able to pay off quickly. Furthermore, if you go over your balance, you’ll also acquire an over limit fee. A good idea is to use no more than 30 percent of your limit at any given time. It’s important to remember your budget and the amount you can afford to repay, not just what the creditor has given you as a limit on your card. This is an important habit to have when it comes to your credit cards. Although our digital world has many advantages, it also has a major disadvantage: credit card fraud. Just because you have the card in your possession doesn’t mean someone hasn’t gotten the number. It’s important to look over statements and receipts to make sure you haven’t been wrongfully charged for something you didn’t buy. While you can’t refuse to pay your entire bill, you can withhold payment on a charge you dispute. Double checking that your charges are correct will save you from paying more than you have to and, if caught early, can prevent someone else from running your credit score into the ground. Credit cards seem to get a bad name at times, however, that doesn’t necessarily have to be the case. If you know how to open and use your credit card accounts wisely, you’ll find yourself building a great credit score and possibly even rewards to send yourself on a trip to paradise. What are some of your tips for using credit cards? What kinds of items do you purchase with them? Do you follow any of these tips already?